Department of Microbiology, Garden City University, Bangalore - 560049, Karnataka, India. ABSTRACT: Biosurfactants are surface active, amphiphilic biochemical compounds containing both hydrophobic and hydrophilic moieties produced by microorganisms. They are produced by a variety of microorganisms mainly fungi, bacteria, and yeasts on their cell surface or extracellularly secreted. Biosurfactant mediated synthesis of nanoparticles has now emerged as a green alternative for enhancing both nanoparticles synthesis & stabilization. One of the modes of action is through adsorbing onto metallic nanoparticles, surface stabilizing the nanoparticles & preventing aggregation. Hence, biosurfactant mediated production of silver nanoparticles (AgNPs) was utilized in the present work. Biosurfactant was produced using Lactobacillus brevis and thus obtained biosurfactant was added to equal amounts of 1mM AgNO3 for production of AgNPs. The primary characterization of the AgNPs was done by visual observation. 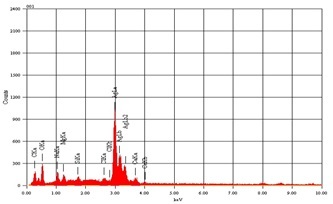 Further, AgNPs were characterized using UV-Vis Spectrophotometer which showed maximum absorption spectra at 420 nm, TEM revealed the size of AgNPs (18 nm). EDS was carried out to determine the presence of silver metal. 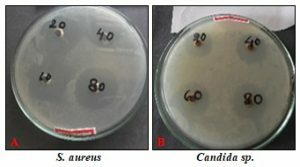 Biosurfactant mediated AgNPs were assessed for the antimicrobial studies on MDR strains of bacteria and fungi (S. aureus and Candida sp. ), of which S. aureus showed comparatively more susceptible. The synergistic effect of biosurfactant & AgNPs enhanced antimicrobial effects on the selected stains compared to the individual effects. INTRODUCTION: Biosurfactants are surface-active biomolecules produced by microorganisms. They are amphiphilic compounds containing both hydrophobic and hydrophilic moieties that allow them to exist or partition at the interface between polar and nonpolar media. They are produced mainly by bacteria, fungi, and yeasts on their cell surfaces and are secreted extracellularly. Biosurfactants have advantages over chemical surfactants in the market concerning low toxicity, better surface and interfacial activity 1. Due to their lower toxicity, greater biodegradability, bio-compatibility, functionality under extreme conditions and specificity in action, biosurfactants have been widely used in numerous industries in the place of their synthetic counterparts 2. Structurally, their hydrophilic moiety can be a carbohydrate, amino acid, a cyclic peptide, phosphate, carboxylic acid or an alcohol and the hydrophobic moiety is mostly either, a long-chain fatty acid, hydroxyl fatty acid or α-alkyl β-hydroxy fatty acid 3. Biosurfactants are classified into two groups: Low-molecular-weight surface active agents (LMW) called biosurfactants, which efficiently lower surface and interfacial tension and High molecular-weight polymers (HMW) referred to as bioemulsifiers which are more effective as emulsion-stabilizing agents. The first group includes glycolipids, lipopeptides, and phospholipids, whereas the second group includes polymeric and particulate biosurfactants such as emulsan and alasan 4. Biosurfactants act as potential stabilizing agents and are emerging as a green alternative for the synthesis and stabilization of nanoparticles. Biosurfactants can be used for high-performance nanomaterial production since they easily form a variety of liquid in aqueous solutions 5. One of the most important properties exploited in the nanoparticles synthesis is their micelle-forming ability. The major concern in nanoparticle synthesis is tuning up these structures to obtain aggregates with desired morphology and properties. The morphology of these nanomaterials can be significantly varied by changing the pH, temperature, surfactant concentration, and the ionic strength of solution 6. Experimental conditions such as rate of reduction and adsorption mechanisms of capping agents with metal ions are some of the factors that can be controlled in the design of nanoparticles. Particularly, capping agents play a very important role in determining the final quality of the particles. It essentially reduces the tendency of nanoparticles to agglomerate, by protecting the surface by either causing steric or electrostatic stabilization. Biosurfactant, as capping agents in nanoparticle synthesis facilitates the uniform dispersion of the nanoparticles in the liquid medium. Biosurfactant mediated synthesis and stabilization of nanoparticles emerging as a greener method is being considered to be a potential method for size-controlled synthesis of nanoparticles. Hence, in our studies, biosurfactants mediated AgNPs were produced, and their efficacy on biofilms were assessed. Chemicals and Media: De Man, Rogosa and Sharpe Agar (MRS) were used to grow L. brevis. Nutrient Agar and Potato dextrose agar was used to subculture Staphylococcus aureus and Candida sp. respectively. Antibiotic discs, Peptone, agar, beef extract, sodium chloride procured from Hi-Media, Silver nitrate, sulphuric acid, acetonitrile, were also procured from Hi-Media (Bangalore, India). Microbial Culture: The bacterial culture L. brevis (MTCC-4463) was procured from Microbial Type Culture Collection Centre (MTCC), Chandigarh Punjab India. Bacterial culture was revived into MRS media at 37 °C for 24 h then used for further experimental studies. Production of biosurfactant mediated AgNPs by Chemical Reduction Method: Biosurfactant mediated AgNPs were produced using L. brevis by the method described by Ida & Govindammal 8. Characterization Studies of Biosurfactant Mediated AgNPs: The biosurfactant mediated AgNPs synthesized were characterized by Visual Observation, UV-Vis Absorption Spectroscopy, Energy Dispersed Spectroscopy (EDS) and Transmission Electron Microscopy (TEM). Antimicrobial Studies: S. aureus is a pathogenic bacteria causing a multitude of diseases. Both community-associated and hospital-acquired infections with S. aureus have increased in the past years, and a rise in antibiotic-resistant strains has accompanied the rise in incidence. The emergence of antibiotic-resistant S. aureus highlights the need for alternative forms of therapeutics other than conventional antibiotics 9. On the other hand, C. albicans causes skin infections in immunocompromised patients. Candida infection is of increasing concern as causative agents of fungal biofilm-related infections. Development of new technologies based on the control of the Candida species biofilm growth is, thus, foreseen as a breakthrough in medicine and will have a strong impact in the clinical practice and preventive medicine 10. Pathogenic microbes remain a major health concern, which is responsible for causing a large number of deaths and hospitalizations each year. Although we have current treatments such as antibiotics, bacteria and fungi are gaining resistance to these therapeutics at an alarming rate. That is why new therapeutic and diagnostic treatments are necessary if we want to be prepared against known and unknown pathogenic microbial infections. A range of potential solutions has been researched in the hope that new treatments and diagnostic techniques will be developed. A large group of these studies includes the implementation of nanotechnologies and nanomaterials to create new antibacterial and antifungal nanomedicines that increased effectiveness and efficiency. In our present study, we assessed the antimicrobial effects of biosurfactant mediated AgNPs on such pathogens. Source of MDR Strains: S. aureus and Candida strains were collected from Fortis hospital, Bangalore, Karnataka. These isolates were maintained on nutrient agar plates and further used for the antimicrobial assay. Antimicrobial Effects of Biosurfactant Mediated AgNPs on MDR Strains: The antimicrobial activity of biosurfactant mediated AgNPs was evaluated against MDR strains of S. aureus and Candida species. These cultures were uniformly swabbed over solidified nutrient agar plates, and different concentrations of AgNPs (20 µl, 40 µl, 60 µl, and 80 µl) were loaded into respective wells to assess the zone of inhibition as a measure of sensitivity. Microbial Culture: The bacterial culture Lactobacillus brevis (MTCC 4463) Fig. 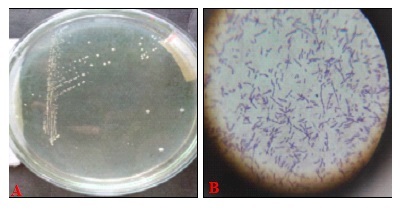 1a and b were procured from Microbial Type Culture Collection Centre (MTCC), Chandigarh, Punjab, India. The cultures were maintained on MRS agar slants at 4 °C. 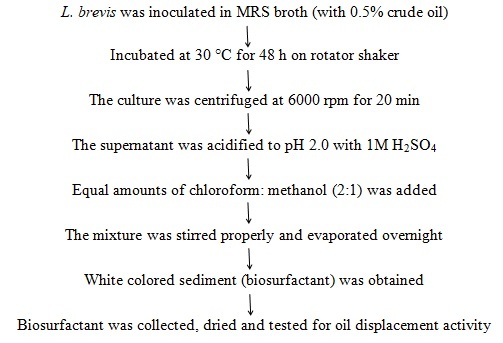 Production of Biosurfactant using L. brevis: The bacterial strain L. brevis was inoculated into MRS broth containing 0.5% crude oil as a sole source of carbon and incubated at pH 8.0, at 30 °C for 48 h on a rotatory shaker for biosurfactant production Fig. 2a. The supernatant after centrifugation was collected and checked for surface activity Fig. 2b for which supernatant was adjusted to pH 2.0 and an equal volume of chloroform: methanol with ratio 2:1 was added to the above mixture. The white colored biosurfactant was observed in Fig. 2c after evaporation. Thus obtained biosurfactant was then dried and stored for further use. Production of Biosurfactant Mediated AgNPs: Equal volumes of biosurfactant (1ml) was added to 1mM AgNO3 and vigorously stirred for 5 min. 20 μl of NaBH4 (1mM) was added to the above mixture and stirred well. The color change from white to brown Fig. 3a and b within five minutes indicated the production of AgNPs. Biosurfactants usually act as a stabilizing agent of the non-toxic, non-hazardous synthesis of nanoparticles. Biosurfactant use has now emerged as an eco-friendly alternative for enhancing both nanoparticles synthesis and stabilization. Because of the biodegradable nature of biosurfactants, they are more environmentally friendly than chemical surfactants 11. Biosurfactant produced by microorganisms plays a very important role in aggregation and stabilization process. One of the modes of action is through adsorbing onto metallic nanoparticles, surface stabilizing the nanoparticles and preventing subsequent aggregation. The mechanism of surfactant absorption depends on the type of surfactant and the thickness of the adsorbed layer. So far no comparative study has been published concerning the influence of the biosurfactants nature and composition on the properties and ability to control the production of nanoparticles 12. However, many approaches are made to synthesize biosurfactant mediated nanoparticles. Nanoparticles were synthesized using two different micro-emulsion approaches. In the first approach, the microemulsion was prepared by dissolving commercial rhamnolipid in heptane and then adding NiCl2.H2O solution to the mixture with continuous stirring. In the second approach, the microemulsion was prepared by adding NH4OH instead of nickel chloride solution. Microemulsion 1 & 2 were mixed. The precipitated nickel hydroxide was separated by centrifugation and washed with ethanol to remove biosurfactant and heptane. The nickel hydroxide was precipitated at 600 ºC for 3 h to convert Ni (OH)2 to NiO. Thus produced nanorods were found to be approximately 22 nm in diameter. The morphology of the synthesized nanoparticles depended on the pH 13. Nanoparticles were also produced using water-soluble rhamnolipids from Pseudomonas aeruginosa as a capping agent for ZnS nanoparticles and highlighted the metal affinity, size and optical properties of the produced rhamnolipid capped spherical ZnS nanoparticles. They were synthesized in an aqueous environment without any organic solvent and were both stable and water soluble. The FT-IR spectra obtained for rhamnolipid capped ZnS nanoparticles showed an affinity between COOH of rhamnolipid and metal ions. The size of the nanoparticles was about 4.5 nm in diameter 14. Lipopeptides biosurfactant has also been reported in nanoparticles synthesis. Surfactants can also be used as a stabilizing agent in the synthesis of the silver and gold nanoparticles. The synthesis involves the reduction of the aqueous AuCl4 using NaBH4 in the presence of surfactin produced by B. subtilis. Surfactin was recovered from the culture supernatant by foam fractionation and added to the pale yellow color chloroaurate solution which turned to red-purple, indicating the change in the metal oxidation state and the formation of gold nanoparticles. The nanoparticles were synthesized at the different pH values 5.0, 7.0 and 9.0 at 4 ºC & room temperature and reported the synthesis of stable nanoparticles at pH 7.0 & 9.0 remaining intact for two months 15. UV-Visible Spectrophotometer: The synthesis and stabilization of AgNPs produced from biosurfactant using L. brevis in the present study were studied by UV-absorption spectrum analysis. 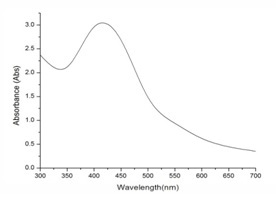 UV-Vis absorption spectrum is sensitive to the formation of AgNPs and showed intense absorption peak around 420 nm Fig. 4 originating from the surface Plasmon of nano-sized AgNPs. Similar results were recorded by the studies carried out by Parthasarathi and Anna Joice 16 where they reported the absorption spectrum of 432 nm for the AgNPs synthesized using biosurfactant produced by P. aeruginosa (PBSC1) cultivated in a low-cost medium. Ida and Govindammal 8, worked on the biosynthesis of AgNPs by rhamnose lipid produced by P. fluorescent MFS-1 from mangrove soil. They reported the absorption peak of AgNPs at 400 nm and explained that the nanoscale silver could be synthesized in reverse micelles using rhamnolipid as a stabilizer. Transmission Electron Microscopy: TEM showed uniformly dispersed triangular AgNPs synthesized from biosurfactant with the average size of 18 nm Fig. 5a & b. Farias et al., 17 synthesized biosurfactant mediated AgNPs by P. aeruginosa cultivated in a low-cost medium formulated with 2.5% vegetable oil refinery residue and 2.5% corn steep liquor and distilled water to stabilize AgNPs in the liquid phase. The particles were initially synthesized using NaBH4 as a reducing agent in biosurfactant reverse micelles and were extracted from the micellar solution to disperse in heptane. Their study revealed AgNPs of size 1-2nm with uniformly distributed and were stabilized by the biosurfactant. The structure of the biosurfactant plays an important role in determining the morphology of the synthesized nanoparticles. These micelles are spherical and favored the formation of spherical nanoparticles during synthesis. As biosurfactants are natural surfactants derived from microbial origin composed mostly of sugar and fatty acid moieties, they have higher biodegradability, lower toxicity, and excellent biological activities. Since the biosurfactant reduces the formation of aggregates due to electrostatic force of attraction, they facilitate uniform morphology and stability of nanoparticles. Ganesh et al., 18 isolated and purified rhamnolipids from P. aeruginosa strain BS-161R and then purified rhamnolipids which were used to synthesize AgNPs. In their study, AgNPs were monodispersed with an average particle size of 15.1 nm and were spherical. 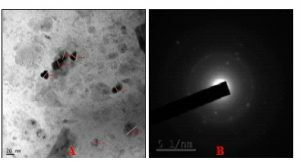 Chandana et al., 5 synthesized biosurfactant mediated AgNPs using Bacillus tequilensis and reported spherical and crystalline AgNPs with size 32 nm. Energy Dispersive X-ray Spectroscopy: The EDS quantifies the elementary constituents of the sample. In the present study, EDS showed the strongest peak at 3 keV Fig. 6 indicating the presence of metallic silver. Similar results were reported by Kumara and Mamidyala 19 who worked on the extracellular synthesis of AgNPs using culture supernatant of Pseudomonas aeruginosa. The EDS analysis in their result revealed 3keV which indicated metallic silver confirming the formation of AgNPs. Antimicrobial Activity of Biosurfactant Mediated AgNPs: The antimicrobial study of biosurfactant mediated AgNPs has shown remarkable effects on both bacteria and fungi Table 1. However, the effects of AgNPs was more effective on S. aureus when compared to Candida sp. At 80 µl concentration, the effects of AgNPs showed 38 mm zone of inhibition with S. aureus while with Candida it was 36 mm Fig. 7. With S. aureus at other concentration, the zone of inhibition ranged from 30 mm to 37 mm respectively while with Candida sp. the range was from 28 mm to 34 mm respectively. The present investigation indicated that the biosurfactant mediated AgNPs has measurable effects on bacteria and fungi. Such AgNPs can be chosen as an alternative source of antibacterial agents compared to conventional antibiotics for which generally the microorganisms attain resistance. Ganesh et al., 18 studied synthesis of biosurfactant based silver AgNPs with purified rhamnolipids isolated from P. aeroginosa BS-161R and revealed that Candida sp. and other bacterial cells are susceptible to the antimicrobial activity of biosurfactant mediated AgNPs which have a minimum inhibitory concentration of 7.81 µg/ml. Their reports suggest that the antimicrobial property of the AgNPs is due to attachment to the cell membrane, penetration into bacteria and damage of the cell with the release of cell contents. Another possibility could be the release of silver ions and also the dimensions of the particles. The smaller the size, the greater the antimicrobial effect. Similar results were reported by Plaza et al., 12 during their of antimicrobial effects of biosurfactant mediated AgNPs. CONCLUSION: To conclude, our objective of work is to search an alternative, eco-friendly, cost-effective means of biosurfactant mediated AgNPs showing broad-spectrum applications such as in medicine, in textile industry, detergent industry, drug delivery, etc. The results obtained in our study were encouraging enough to synthesize such AgNPs using biosurfactant from L. brevis acting as a capping agent for the production of small-sized (18 nm) AgNPs with longer stability. Apart from the natural antimicrobial ability of biosurfactant, the AgNPs derived from biosurfactant have also shown appreciable, enhanced antibacterial and antifungal effects which can be utilized as an alternative means of antibacterial agents compared to the conventional antibiotics for which the micro-organisms have already shown resistance. ACKNOWLEDGEMENT: The authors like to acknowledge Garden City University, Bangalore for providing all the necessary facilities to carry out the research work successfully. CONFLICT OF INTEREST: The authors declare that there are no conflicts of interest regarding the publication of this manuscript. Sil J, Dandapat P and Das S: Health care applications of different biosurfactants: a review. International Journal of Science and Research (IJSR) 2017; 6(10): 41-50. Singh P, Ravindran S, Suthar JK, Deshpande P, Rokade R and Rale VK: Production of biosurfactant stabilized nanoparticles. Int J Pharm Bio Sci 2017; 8(2): 01-707. Satpute SK, Bhuyan SS, Pardesi KR, Mujumdar SS, Dhakephalkar PK, Shete AM and Chopade BA: Molecular genetics of biosurfactant synthesis in microorganisms. Adv Exp Med Biol 2010; 672: 14-41. Smyth TJP, Perfumo A, Marchant R and Banat IM: Isolation and analysis of low molecular weight microbial glycolipids. In Handbook of Hydrocarbon and Lipid Microbiology; Timmis, K.N., Ed. ; Springer-Verlag: Berlin, Germany 2010: 3705-3723. Chandana VK, Hemalatha V, Kalyani DP, Kumar M and Hemalatha KPJ: Biological synthesis and characterization of silver nanoparticles using biosurfactant producing Bacillus tequilensis. International Journal of Current Advanced Research 2017; 6(12): 8405-8409. Deepika KV, Raghuram M and Bramhachari PV: Rhamnolipid biosurfactant production by Pseudomonas aeruginosa strain KVD-HR42 isolated from oil contaminated mangrove sediments. African Journal of Microbiology Research 2017; 11(6): 218-231. Sharma D, Saharan BS, Chauhan N, Bansal A and Procha S: Production and structural characterization of Lactobacillus helveticus derived biosurfactant. Hindawi Publishing Corporatione Scientific World Journal 2014; Article ID 493548: 9. http://dx.doi.org/10.1155/2014/ 493548. Maragatham A and Govindammal M: Biosynthesis of silver nanoparticles by rhamnolipid produced by Pseudomonas fluorescens MFS-1 from mangrove soil. International Journal of Pharmaceutical & Biological Archives 2014; 5(5): 135-140. Kong C, Chee CF, Richter K, Thomas N, Rahman NA and Nathan S: Suppression of Staphylococcus aureus biofilm formation and virulence by a benzimidazole derivative, UM-C162. Scientific Reports 2018; 8: 2758; 1-16. Fracchia L, Cavallo M, Martinotti GM and Banat IM: Biosurfactants and bioemulsifiers. In Biomedical and Related Applications - Present Status and Future Potentials, Biomedical Science, Engineering and Technology; Ghista, D.N., Ed. ; In Tech: Rijeka, Croatia 2012: 325-370. 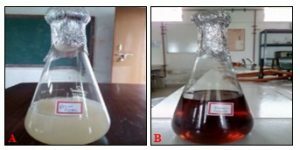 Rane AN, Baikar VV, Kumar VR and Deopurkar RL: Agro-industrial wastes for production of biosurfactant by Bacillus subtilis ANR 88 and its application in the synthesis of silver and gold nanoparticles. Frontiers in Microbiology 2017; 8: 492. Płaza GA, Chojniak J and Banat IM: Biosurfactant mediated biosynthesis of selected metallic nanoparticles. Int J Mol Sci 2014; 15: 13720-13737. Palanisamy P: Biosurfactant mediated synthesis of NiO nanorods. Mater. Lett 2008; 62: 743-746. Narayanan KB and Sakthivel N: Biological synthesis of metal nanoparticles by microbes. Add. Colloid Interface Sci 2010; 156: 1-13. Reddy AS, Chen CY, Baker SC, Chen CC, Jean JC, Fan CW, Chen HR and Wang JC: Synthesis of silver nanoparticles using surfactin: A biosurfactant as the stabilizing Mater Lett 2009; 63: 1227-1230. 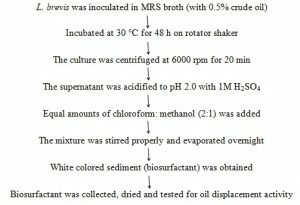 Joice A and Parthasarathi PR: Production and characterization of biosurfactant from Pseudomonas aeruginosa PBSC1 isolated from mangrove ecosystem. African Journal of Biotechnology 2014; 13933: 3394-3401. Farias CBB, Silva AF, Rufino RD, Luna JM, Souza JEG and Sarubbo LA: Synthesis of silver nanoparticles using a biosurfactant produced in the low-cost medium as the stabilizing Electronic Journal of Biotechnology 2014; 17: 122-125. 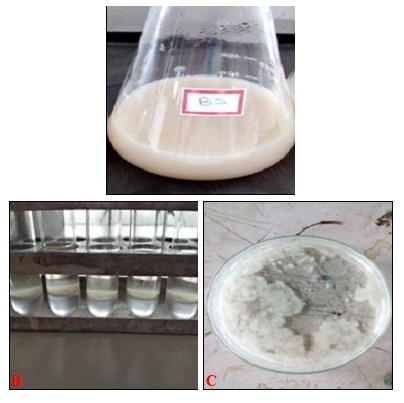 Ganesh KC, Mamidyala SK, Das B, Sridhar B, Devi GS and Karuna ML: Synthesis of biosurfactant-based silver nanoparticles with purified rhamnolipids isolated from Pseudomonas aeruginosa BS-161R. J Microbiol Biotechnol 2010; 20: 1061-1068. Kumar CG and Mamidyala SK: Extracellular synthesis of silver nanoparticles using culture supernatant of Pseudomonas aeruginosa. Colloids Surf B Biointerfaces 2011; 84(2): 462-6. Kulkarni P, Chakraborty R and Chakraborty S: Biosurfactant mediated synthesis of silver nanoparticles using Lactobacillus brevis (MTCC 4463) and their antimicrobial studies. Int J Pharm Sci & Res 2019; 10(4): 1753-59. doi: 10.13040/IJPSR.0975-8232.10(4).1753-59. Authors Address: Department of Microbiology, Garden City University, Bangalore, Karnataka, India.